As dead in no wise, did he cease his miracles. Saint Luke's grandparents emigrated from Aegina to mainland Greece because their native island was exposed to Saracen raids. After various tribulations, they settled in the village of Kastorion, where they prospered, and there in 890, Saint Luke was born, the third son in a family of seven children. From his earliest years, he showed an inclination for a life of contemplation and austerity such as might be expected in an elder versed in monastic ascesis. He abstained from meat, eggs, dairy products and all delicacies. His usual diet consisted of barley bread and vegetables. He drank nothing but water, and on Wednesdays and Fridays he would fast. Occupied during the day herding cattle or working in the fields, he would often give away his meager provisions to poor folk, and sometimes even his clothes, returning home naked. On the death of his father, Luke gave up work on the farm in order to devote himself entirely to the spiritual life, and such was his progress that at prayer he would be raised above the ground. 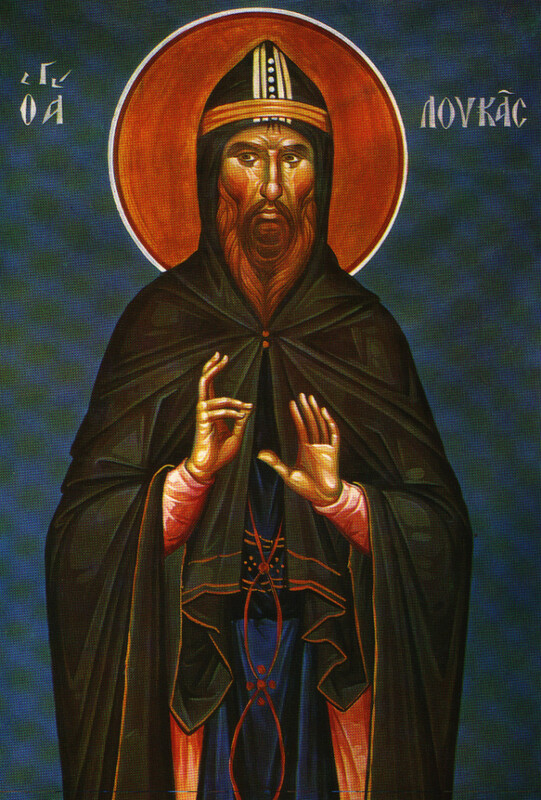 Eager to embrace the monastic life, one day he absconded from home and set out for Thessaly, but he was arrested by the military, who took him for a runaway slave, and wanted to know who his master was. When Luke told them with complete ingenuousness that Christ was his master, they belabored him and threw him into prison. On being sent home, he bore in silence the thrashings and tirades to which he was subjected. However, God looked with favor upon his perseverance and when, coming from Rome, two monks stopped in the village on their way to Jerusalem, he succeeded in persuading his mother to let him join them. When they reached Athens, the monks left the fourteen-year-old lad in the care of the Abbot of the monastery of the city, who soon after clothed him in the Small Schema. Meanwhile, his bereft mother besought the Lord for Luke with such lamentations that the Abbot, seeing the tearful woman every night in a dream calling for her son, decided finally to send him home. 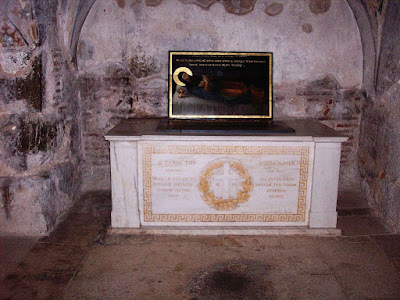 After four months, his mother allowed the young monk to settle nearby as a hermit on Mount Joannitsa, where there was a chapel dedicated to the Holy Unmercenary Physicians Kosmas and Damian. His comfortless cell was for him no place of repose, but it served to screen from the eyes of the world the contests in which he engaged for the love of God. Inside, he dug a grave so as always to have in mind the remembrance of death. He warred unremittingly against the tyranny of sleep and every night kept vigil, making countless prostrations with the prayer: Lord have mercy! He tended a small garden whose produce he used to give away to his visitors or his neighbors. As for himself, the more he wore out his body with austerities and eremetic labors, the more cheerful he became, radiating love for mankind and even for wild animals and poisonous snakes. One day, two venerable monks on their way to Rome called on him. Seeing the demeanor of a perfect monk in the eighteen-year-old ascetic, they clothed him in the Great Angelic Schema. Once clad in the armor of a tried and tested warrior, Luke went into deeper seclusion and attained such a degree in his fasts, tears and prayers that God granted him the gift of miracles and of prophecy. Thus he predicted the incursion of the Bulgarians who ravaged Greece in 917. Many people came from the country round about to receive the blessing of the renowned man of God, or to confess their sins. He often helped them in the task by revealing to them their secret sins and, after giving them the necessary penance, he would grant them pardon in the name of God. On one of these occasions, the devil took the opportunity of sending three women to him on the pretext of confession, and after their departure, he instilled impure thoughts in him. He battled against the temptation for three days and nights with tears and prayer, and he was delivered from it by an apparition of an angel, who granted him the grace of impassibility, so that, like an angel in the flesh, he was never again troubled by the slightest carnal thought or by the approach of women. After spending seven years on Mount Joannitsa, the threat of Bulgarian raids obliged Luke and the small group of companions who had gathered around him to move to a neighboring island. But a Bulgarian incursion again forced them to flee. The Saint had to swim to safety, and eventually found refuge in Corinth. While he was there, he decided to attend elementary school, even though now an adult, because of his great desire to read the Holy Scriptures. However, the pupils were so undisciplined that he soon found that remaining unlettered was preferable to enduring their bad company. He was thinking of going to live near a renowned stylite at Patras when another stylite, who lived near Corinth, asked him to live with him. Luke was delighted to take the path of obedience, and for ten years fished, carried water and wood and did whatever else the elder required of him, with complete meekness. With the restoration of peace in 927 under the new Bulgarian King Peter, Luke was able to return to his hermitage on Mount Joannitsa, where he redoubled his zeal in ascesis and his loving kindness towards visitors of all conditions. Hearing one day that the Archbishop of Corinth was passing by, he went to pay his respects and brought him some vegetables from his garden. The Archbishop asked to visit his cell. Greatly edified by his poverty and way of life, he wanted to leave him some money but the Saint refused to accept it, telling him that what he needed was not gold but prayers and teaching. In answer to his questions, the bishop told him that hermits living far distant from churches could communicate in the presanctified Holy Gifts. On another occasion, the holy man was asked why he did not go to the monasteries for the great feasts, and he replied, "The feasts and hymns have acquisition of the fear of God as their aim; so what purpose would they serve for someone who has acquired the fear of God through hesychia and silence?" One day, while Saint Luke was staying at a monastery which he used to visit near Thebes, a leading citizen of the town came to implore his aid on behalf of his son who was mortally sick. The Saint at first refused, saying that God is the only physician of souls and bodies but, upbraided by his friend Anthony, the Abbot of the monastery, he went that night to the bed of the sick man to pray. Next morning, the young man got up, took his horse and rode in perfect health to the baths. 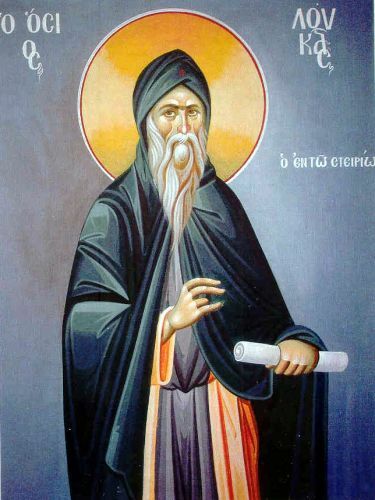 So many people were drawn to the man of God's cell by the fame of his miracles and prophecies that his stillness was disturbed and he left Mount Joannitsa for the tranquil little port of Kalamion. He spent three years there, until a Hungarian raid forced him to take refuge on the barren island of Ampelon. From time to time, his sister would bring him a supply of bread, which he was not slow to give away to the needy and to passing sailors, while alleviating their sorrows in all sorts of ways and assuring them of better days to come. He lived there for three years, lacking the basic necessities and afflicted by a painful illness, which he preferred to endure for the sake of requital from heaven rather than employ the remedy revealed to him in a vision. In the end, he gave way to the entreaties of his disciples and returned to the mainland. He settled in a place called Steirion (or Soterion) which was difficult of access and of great natural beauty. He cleared the ground, transformed it into a pleasant garden and built his hermitage nearby. There, in the company of his closest disciples, he endeavored for the rest of his life to keep his virtues hidden. But his reputation as a new prophet made him sought out by the highest in the land, who strove with one another for his friendship. He would foretell the course of their careers, and predicted twenty years beforehand the reconquest of Crete from the Arabs by Nikephoros Phokas (961). In those days of incessant piratical and barbarian raids, the Saint was always informed in good time of the danger by a voice from heaven, and was therefore able to warn the people of the region to take refuge in the woods and caves. A visitor afflicted by evil thoughts about the Saint, saw him in a vision standing shining bright on a purple carpet stretched out in the sky. Saint Luke fell ill in the seventh year of his sojourn in Steirion. He embraced his disciples and all the people from round about who hastened to experience the joy of his presence for the last time. He asked them to pray for him and peacefully gave back his soul to God on 7 February 953. A fragrant oil which exuded from his tomb was collected in a lamp, and the tomb itself became the source of many miracles of healing. As the Saint had foretold, two great churches were later built there and a monastery, which remains a famous place of pilgrimage to this day (known as Hosios Loukas Monastery). From The Synaxarion, Vol. 3, Holy Convent of the Annunciation of Our Lady, Ormylia (pg. 442-447). Let us firmly honour Luke the God-bearer with hymns and chants, the glory of the faithful, the boast of the venerables, bright light of Steirion and its true inhabitant; he brings near to Christ those who cry out in faith: Glory to Him Who has strengthened thee; glory to Him Who has crowned thee; glory to Him Who through thee works healings for all. God in ineffable judgment chose thee before thou wast fashioned according to His good pleasure; He took thee from thy mother's womb, He sanctified thee as His servant. As the Lover of mankind, He guided thee to Himself, before Whom thou dost now stand rejoicing, O Luke.